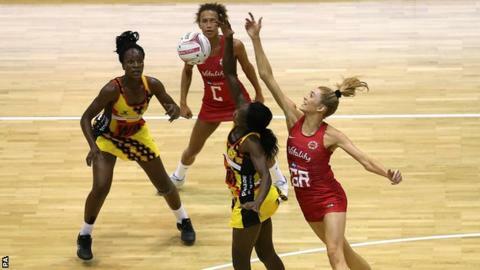 England wrapped up a series win over Uganda with a match to spare, despite a late fightback from the visitors at London's Copper Box. Having edged Tuesday's opener in Liverpool by four points, the Roses won 65-53 to take an unassailable 2-0 series lead into Sunday's final match. "We've still got one important match to go," said head coach Tracey Neville. "Although we lost the second half, I was really pleased with the execution and the players that injected a little bit of energy into the game." With Helen Housby and Rachel Dunn combining well, the Roses took a 17-point lead at the halfway stage, while Neville said goal defender Jodie Gibson was England's standout player. Fran Williams was handed a debut as Neville looked to give players opportunities before next summer's Netball World Cup in Liverpool. "There's some answers from our coaching point of view about players that are still in contention for that World Cup place and about giving them opportunities to put their best foot forward," Neville told BBC Radio 5 live sports extra. "You can't play the same seven in every game of a tournament, so I want to know what impact players can make when they come on." "We have still got to be clinical and we have objectives we want to achieve," added Neville. "It is about the big picture of the World Cup so we have got to keep our mind focused on that."